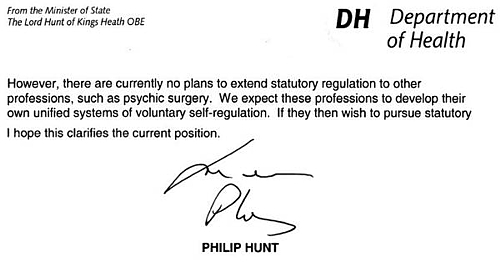 A colleague wrote to his MP to ask if anything could be done about the defrauding of the public by “psychic surgeons”. He wrote, in particular, about Stephen Turoff. Turoff was the subject of the first episode of “Trust me I’m a Healer”, a programme that looked at “fake psychic healers”. They are the BBC’s own words (see badpsychics.com). Eventually my colleague got an answer from Lord Hunt, junior minister at the Department of Health (generally loyal Blairite, but he did resign over Iraq). The response makes one wonder what planet the minister is living on Psychic fraud a “profession”? And capable of self-regulation? This letter is just surreal. Clearly misunderstanding the nature of science is not restricted to any political party. In any case, regulation of crackpot medicine arguably does more harm than good (see Letter to the Times). (or whatever) and pretend to be proper doctors. And foremost among those pressing for this sort of phony respectability has been the Prince of Wales Foundation for Integrated Health (see here and here).